Charter fishing Lake Michigan for Salmon, Steelhead and Trout on Muskegon, Manistee, Pere Marquette river fishing with Capt. Art and Experience the thrill of a lifetime fishing with family, friends and business associates for trophy Salmon, Steelhead and Trout from the #1 Rated World Class fishing Port of Muskegon on beautiful Lake Michigan and the famous Muskegon River (big Mo) from Newaygo, Muskegon and Croton Dam. All river charters include incredible scenery while building great memories. 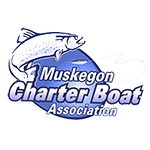 I provide a Year Round charter service as a Muskegon river guide and a Lake Michigan Charter Captain. 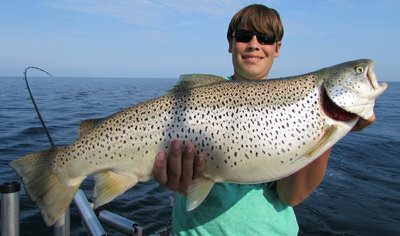 Fish Muskegon and Get Hooked on Fishing – MICHIGAN’S BEST KEEP SECRET! “FISH STIX” (top picture) is a 30′ Wellcraft Express Cruiser with twin V-8 engines, she’s a tournament style fishing machine. 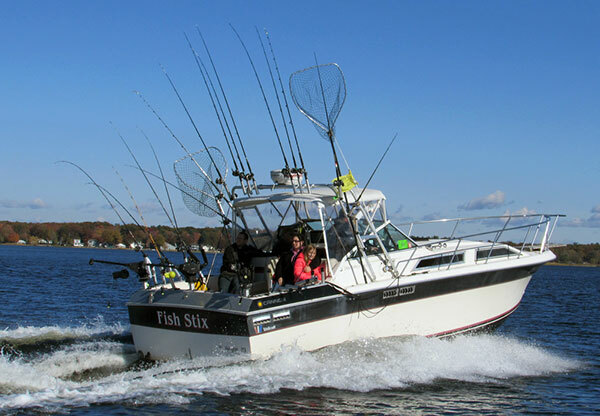 “FISH STIX” accommodates 6 persons and 3 crew members for Lake Michigan and Muskegon Lake Sport Fishing. All tackle and equipment provided and I clean and bag your fish in Professional fish cleaning station. 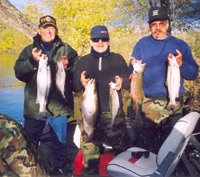 Your pictures will be added to my fishing report, photo gallery, and Steelhead Charters facebook page. The Steelie II is a Roughneck Jet boat, center console with walk a round design, spacious for river fishing and accommodates 3 persons plus the captain for Muskegon, Manistee, Pere Marquette River trips . Upon request for winter fishing I have a enclosure and heater for your comfort. You are welcome to bring your own fly rod to fish with, please let me know in advance otherwise all tackle and equipment is provided. I will teach you new techniques that will make you a better angler in one day. Your pictures will be added to my fishing report and or photo gallery. 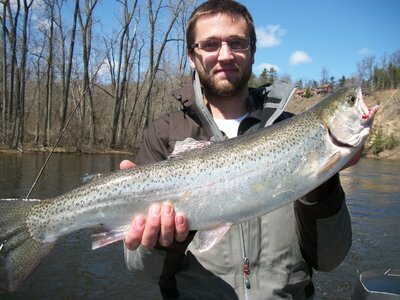 We Will Get You Hooked on Fishing in Muskegon and Newaygo, Michigan.